Students will develop skills in expressive and receptive use of American Sign Language and specific technical skills required to interpret and transliterate. The A. Eugene & Bernice Hoeper ASL and Interpreting Program offers courses in American Sign Language (ASL) and Interpretation between ASL and English. Students will first obtain proficiency in ASL and Deaf Culture through a wide variety of learning activities to enhance practical skills as well as theoretical knowledge. These include on-site observations, service-learning, attendance at Deaf-related community activities, guest lectures, video and audio lab assignments. Students who are not yet fluent in American Sign Language (ASL) will start by working toward the Associate of Arts in ASL and Deaf Culture in order to acquire the language skills required to start interpreting. The program offers language courses for basic to advanced signers. Students may start in ASL 1 or may screen into a higher level of ASL if they have some prior knowledge of ASL. To arrange for a screening please contact Ms. Kimberly Lippincott at Klippincott@ccbcmd.edu. Admission to the Associate of Applied Science or Certificate program in Interpreter Preparation requires that students meet with the program coordinator and obtain an American Sign Language Proficiency Interview (ASLPI) score of 2 or higher. CCBC offers 3 program options. The A.A. in ASL and Deaf Culture is ideal for students still learning ASL. The A.A.S in Interpreter Preparation is ideal for students who are proficient in ASL and do not already have a degree. 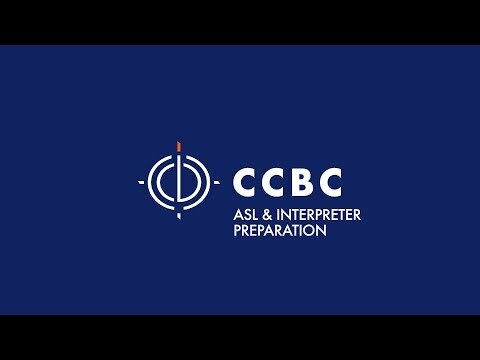 The Certificate in Interpreter Preparation is ideal for students who are proficient in ASL and already have a Bachelors degree. Transcript evaluation may be necessary to determine if prerequisites have been fulfilled. Students completing the A.A. in ASL and Deaf Culture may consider careers in human services with the Deaf and Hard-of-hearing community. Graduates of this program use their conversational ASL skills in a variety of work settings. Graduates of the A.A.S. or Certificate in Interpreting may consider self-employment or private practice positions in the corporate and non-profit sectors, or work placement through an interpreter referral agency. Employment opportunities for interpreters span multiple settings including educational, medical, mental health, religious, performing arts, legal, and government. Currently, qualified interpreters are in demand in all fields.